AXI4-Stream-based target IP such as AXI Ethernet. 18  * change all the needed parameters in one place. 74 * This is the main function for the DmaPs interrupt example. 78 * @return    XST_SUCCESS to indicate success, otherwise XST_FAILURE. 104  * Interrupt Example to test the DMA. 106  * @param    DeviceId is the Device ID of the DMA controller. 108  * @return    XST_SUCCESS to indicate success, otherwise XST_FAILURE. 156      * Setup the interrupt system. 225  * connect the interrupt handler. 227  * @param    GicPtr is the GIC instance pointer. 228  * @param    DmaPtr is the DMA instance pointer. 261      * interrupt handling logic in the processor. 348 * @param    Channel is the Channel number. 349 * @param    DmaCmd is the Dma Command. 350 * @param    CallbackRef is the callback reference data. 30     * interrupt handling logic in the processor. 3 * Copyright (C) 2010 - 2016 Xilinx, Inc.  All rights reserved. 13 * all copies or substantial portions of the Software. 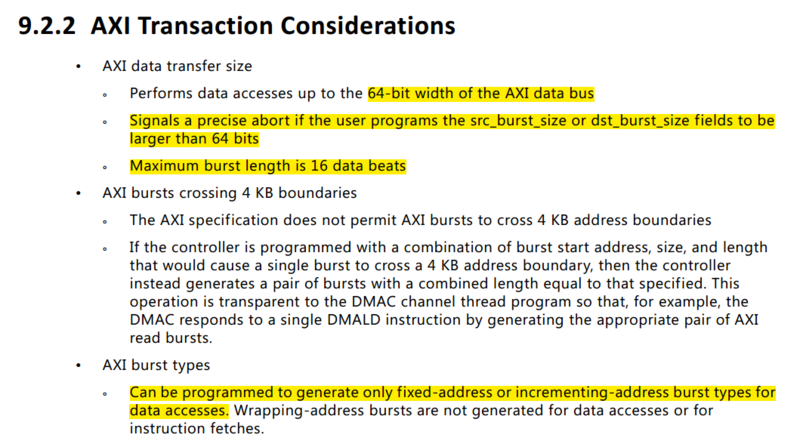 17 * (b) that interact with a Xilinx device through a bus or interconnect. 29 * this Software without prior written authorization from Xilinx. 42  * core for data packet loopback. 51  * proper operation of this code. 60  *                  simple DMA,Added interrupt support for Zynq. 65  *               Added V7 DDR Base Address to fix CR 649405. 66  * 6.00a srt  03/27/12 Changed API calls to support MCDMA driver. 67  * 7.00a srt  06/18/12 API calls are reverted back for backward compatibility. 70  * 7.02a srt  03/01/13 Updated DDR base address for IPI designs (CR 703656). 72  *               removed the defines for S6/V6. 100  * Device hardware build related constants. 165  * We set the coalescing threshold to be the total number of packets. 166  * The receive side will only get one completion interrupt for this example. 209  * Flags interrupt handlers use to notify the application context the events. 235 *        - XST_FAILURE if example fails. 352             xil_printf("Failed test transmit%s done, "
411 * This function checks data buffer after the DMA transfer is finished. 413 * We use the static tx/rx buffers. 420 *        - XST_FAILURE if validation is failure. 457 * This is the DMA TX Interrupt handler function. 463 * @param    Callback is a pointer to TX channel of the DMA engine. 536 * is present, then it sets the RxDone flag. 538 * @param    Callback is a pointer to RX channel of the DMA engine. 574          * NEED a way to handle this or do not call it?? 604 * DMA, it assumes INTC component exists in the hardware system. 606 * @param    IntcInstancePtr is a pointer to the instance of the INTC. 608 * @param    TxIntrId is the TX channel Interrupt ID. 609 * @param    RxIntrId is the RX channel Interrupt ID. 687      * the specific interrupt processing for the device. 724 * This function disables the interrupts for DMA engine. 87  * Interrupt Example to test the DMA. 89  * @param    DeviceId is the Device ID of the DMA controller. 91  * @return    XST_SUCCESS to indicate success, otherwise XST_FAILURE. 67 * is present, then it sets the RxDone flag. 69 * @param    Callback is a pointer to RX channel of the DMA engine. 105          * NEED a way to handle this or do not call it? ?